It’s embarrassing how many of my meals include one of these tortillas. Especially lunches, and especially in the 9-ish months I’ve been working from home. Quesadillas? Yeah, at least once a week. And I will put just about anything in them. Pizza? That usually happens at least once a week, too. 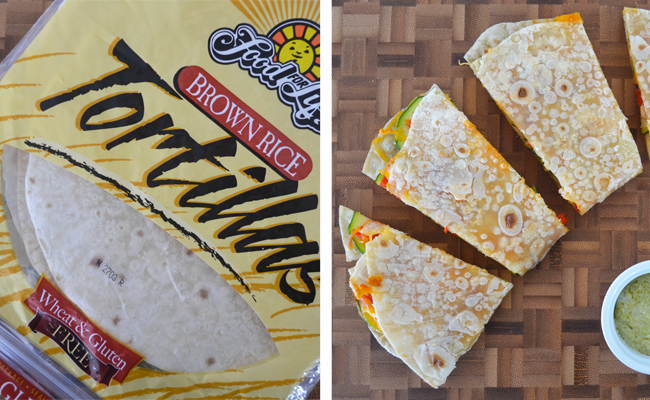 It’s true: rice tortillas lack the flexibility of “normal” flour tortillas, so they’re not so great for sandwich wraps (or anything that involves a lot of bending). However, crisped up in a pan or the oven, they make a great vehicle for healthy toppings and fillings, and that’s why I love them. Plus, once cooked, they’re easy to wrap up and bring on-the-go — I always make a sandwich-quesadilla hybrid with one of these and wrap it up when I travel! Once the tortilla is defrosted (i.e. it’s somewhat pliable), spread half of the cheese on one half of the tortilla surface. Then, layer on the zucchini slices, red pepper, chicken, and rest of the cheese. Fold the tortilla in half, and press down. Let the quesadilla cook for 2-3 minutes more, or until the cheese is melty and the bottom of the tortilla is turning golden brown. Flip, and continue cooking or another 1-2 minutes, or until the tortilla is golden brown. Remove from pan, slice, and serve! I served mine with 1 tablespoon greek yogurt + 1 tablespoon pesto, but you can really use whatever you like! Tags: Brown Rice, Brown Rice Tortilla, Chicken, Food for Life, Gluten-Free, Quesadilla, Roasted Red Pepper, Tortilla, zucchini. Bookmark the permalink.